You clean your equipment to remove bacteria. Make sure the tool you’re doing it with doesn’t leave scratches that actually promote bacterial growth! 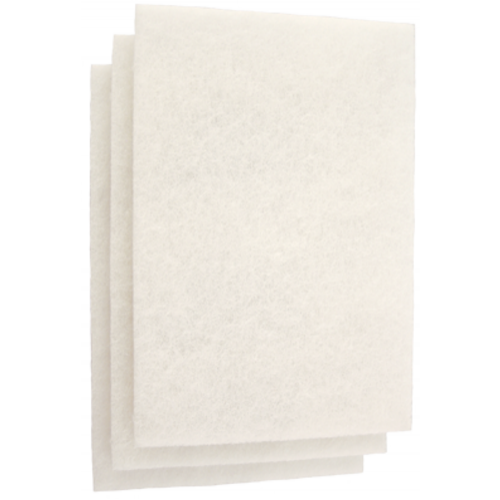 These pads are made of soft, woven fibers making them ideal for equipment cleaning. They are tough enough to scrub off scum and debris without scratching most surfaces. These scrubbers are the best choice for cleaning stainless steel. Also good for chrome, copper, porcelain, glass, and plastic! 9" L x 6" W x 1/4" thick. Sold in packs of three. Use in clean up - invaluable! These are the best for cleaning conicals! does not scratch the inside of the fermenters. I recommend this product but only for very smooth surfaces. Even then the pad leaves bits and pieces. It tends to fall apart a bit more than I would like. Perhaps its unavoidable to get this nice soft pad that doesn't scratch, but also doesn't hold together as much as I'd like. They work great for cleaning my large Speidels. They dry thoroughly when you are done so they don't smell funky after 1 or 2 uses. I use these on my kettle and Speidel fermenter. They're tough enough to scrub off boiled-on scum from the kettle and gentle enough not to scratch the plastic. I bought multiple packs of these. They are great for scrubbing without scratching. A must have for any brewer of any level. Love these scrubbers. Don't know if it's recommended, but I wash them in my laundry after using to make sure all the gunk comes out after cleaning. I used these to clean my new Speidel fermenter. They worked great and there was no scratching. I like these scrubbers because they are hard on beer stone and debris but gentle on stainless. I use them all the time on my kettles and kegs. Combine with Barkeepers Friend, and gets old kegs to a nice shine.